The Dell D3218HN is designed to provide a big yet basic IPS screen for mixed use which includes document processing and entertainment. The low native resolution is friendly for low-spec machines and older gaming consoles, but 1440p or 4K is more suited to this screen size. The Dell D3218HN doesn’t offer dazzling specs, but its big screen at a low price packaging makes it an attractive monitor for the masses. As Dell plans is return to the public markets, it is starting to crank out increased offerings in the high end monitor space. The Dell D3218HN sports a minimalist aesthetic that looks clean and neat, although it lacks the refinement of the brand’s S-series of displays. The monitor comes in matte white which makes it look appealing for themed builds. However, the aesthetic is distracted by black bezels which are thicker than what we’d like. Affordability is the Dell D3218HN’s main selling point, so the cut corners and omission of creature comforts isn’t surprising. Build quality is still decent, but there are a few issues such as uneven seams or gaps. Despite these complaints, the large monitor still manages to stand firm on a desk’s surface. This is thanks to the Dell D3218HN’s stand which has a sizable rectangular base. The footing is hollow in the center, providing a spot to place knick-knacks such as keys or phones. We like the design and the stability this part provides, but it can only offer tilt which makes adjustments for a monitor of this size awkward. Thankfully, you can substitute this mechanism for an articulated VESA mount that supports a 100 x 100 bolt pattern. The Dell D3218HN is also very friendly with wall mounting since its rear bulge is flat. It’s also lightweight at around 16lbs, so finding a suitable armature shouldn’t be too difficult. The Dell D3218HN’s I/O layout is simplified as well since it only includes HDMI 1.4 and VGA. We wish the brand at least added another HDMI receptacle for a secondary device such as a gaming console. You also don’t get built-in speakers with the package, although we reckon that’s easy to ignore due to the low price. 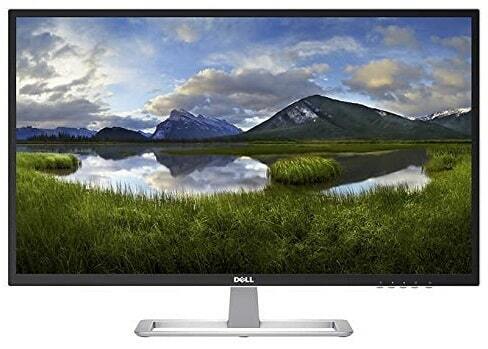 The Dell D3218HN features a 32-inch IPS panel with a 1920 x 1080 resolution, 60Hz refresh rate, and a 4ms response time. These numbers aren’t special, and we recommend avoiding this monitor if pixelation bothers you. The screen’s low pixel density reduces the sharpness of the overall image, but its less apparent if you sit at a distance. But for the price, we can consider the fact that the Dell D3218HN offers a decent picture quality. Games and movies look decent enough for casual enjoyment, plus text and small images are easy to read and discern. This model is ideal for day to day use in offices and homes, even if its performance numbers are lackluster. The Dell D3218HN is capable of producing 97% of the sRGB gamut despite Dell’s low specification of only 84%. Color accuracy out of the box is dismal at Delta E 4.5, but it can be improved to .5 using a calibration tool. Using the latter will also improve the Gamma levels, but buying a device such as the Spyder Elite is not worth it for this display. We recommend users to adjust the screen according to their liking or use the Scenery image filter for day to day tasks. But keep in mind that selecting any of the presets will lock out the brightness adjustment which is crucial for comfortable use. The contrast for the Dell D3218HN exceeds 1400:1 in our tests which usually equates to rich colors and deep blacks. The WLED backlight on this model is powerful as well, reaching around 350cd/m2 as opposed to the 300cd/m2 specified. Brightness uniformity is surprisingly decent as well, although dark images have noticeable variances and some apparent bleeding. This flaw makes the ideal room ambiance for the Dell D3218HN a bit complicated. The maximum brightness can fight off a lot of glare, but the glossy finish of the screen sometimes fights this with its reflectiveness. 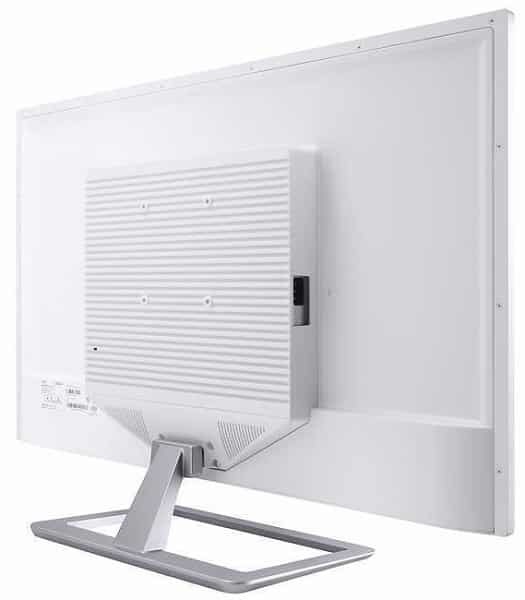 Viewing the monitor in a dark room will reveal the deviances in contrast across the panel, plus the high backlight levels are not ideal for prolonged use. The Dell D3218HN isn’t a gaming monitor, so it does not come with the usual features such as FreeSync or blur reduction. The panel’s average response time is sufficiently quick enough to lessen the blurring down to a minimum, but the option to apply an overdrive would have been appreciated. The 60Hz limit also comes into play here, creating the limitations presented by the specs for gaming applications. At least, the Dell D3218HN clocks in at only 9ms which is a fantastic score that’s normally found on gamer-centric variants. Playing Spider-Man 2018 using our PS4 was enjoyable since there were no delays between the controls and the screen. The Dell D3218HN is a decent monitor for everyday use that comes with an attractive size you won’t normally find at this price range. The IPS panel offers decent imaging performance even if there are a few noticeable quirks. The responsiveness of the display makes it fit for casual gaming, but the limited controls in the OSD could use some improvements. But what it comes down to is the Dell D3218HN’s unbeatable price at the time of this review. Other offerings are limited to 27 inches at this price point, making this model a far more attractive option. If you are looking for a cheap display that’s the size of an LCD TV for mixed use, the Dell D3218HN is an ideal candidate.